The familiar occupant who enthusiastically described Carolina Hurricanes games for years from the fifth-floor radio booth is gone. There has been an empty feeling for many fans since Kaiton decided against taking a significant pay cut and decided to stop calling Canes games. But that radio booth isn’t empty. It’s all a part of the team’s transition from a having a stand-alone radio-only broadcast featuring the Hall of Fame broadcaster to becoming the third NHL team to simulcast on radio the audio from its television broadcast. In addition to no longer hearing Kaiton’s mellifluous voice, you also don’t hear Ray Otis introducing segments. The good news is that the voice of the Canes, now both on TV and radio, is one of the best hockey voices in North America in play-by-play announcer John Forslund, who worked alongside Kaiton on that June 2006 evening. The other details had to be worked out, though. Last season was Alec Campbell’s first as the host of the pregame (“Storm Watch”) and postgame (“The Aftermath”) radio shows on WCMC (99.9 The Fan), the Canes’ flagship station. The producer for nearly three years of “Adam and Joe,” the station’s afternoon drive-time show, watched home games from elsewhere in the press box. This season, Campbell watches from the radio booth, accompanied by Adam Gold, who reports on the team and gives Campbell further content by doing interviews at morning skates and after games. The TV trio of Forslund, analyst Tripp Tracy and host Mike Maniscalco provides the radio content during each period. But it’s Campbell’s job this season to produce radio content during the intermissions in addition to “Storm Watch” and “The Aftermath.” That wasn’t part of his duties last season. Making sure that this all works is engineer John Brockwell, who has long produced the radio broadcasts and continues in that role. 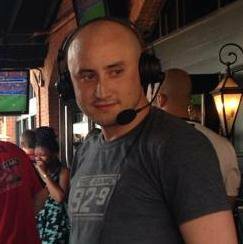 Like before, the pregame and postgame shows are a WCMC-only production with a separate engineer, and can only be heard on 99.9, WRALSportsFan.com or its app. Once “Storm Watch” ends, Brockwell produces the radio broadcasts and guides Campbell as he continues to broadcast a few minutes before the game. At that point, the broadcast also is heard on Sirius and nhl.com. Currently, no other radio stations air Hurricanes broadcasts. Campbell gave way to Kaiton a lot earlier than Forslund and Tracy are first heard on the radio each game. Campbell goes to a commercial shortly before the game starts and the TV crew takes over after the break ends. The TV and radio haven’t always meshed seamlessly. On Monday night before the opening draw, Rebecca Kaple, working from a Fox Sports Network studio, said on TV, “here’s John and Tripp with that call from Detroit.” Forslund responded with, “thank you, Rebecca.” Those were the first three words radio listeners heard coming out of a commercial, and they didn’t hear any of Kaple’s words. An Elon University graduate who grew up in Hickory, Campbell previously worked at Sirius XM Radio, and sports stations in Atlanta (WZGC), Charlotte (WFNZ) and Chicago (WSCR). A key “Storm Watch” element before this season was an interview with Kaiton. To replace that segment, Campbell talks to a member of the media who covers that night’s Canes opponent. For home games, he tries to get that interview during the morning skate, and he must talk to the reporter on the phone from the studio when Carolina is on the road. Before Monday’s win at Detroit, Campbell interviewed Ken Kal, the veteran radio voice of the Red Wings. A recorded Kaiton interview — usually with a current or former player — used to fill most of the first intermission. In his last segment, however, he assessed the season and team. The second intermission always included “Kaiton’s Corner,” in which Kaiton answered listener questions. Here is the last installment of that. This season, Tracy takes the few steps from the TV booth to the radio booth for home games to talk with Campbell during one of the intermissions to analyze how the game has gone. It was during the first intermission the first few games, but it’s been the second intermission the last two games. For road games, Tracy does the segment with Campbell using an app. For the intermission that doesn’t include Tracy, most of the time is filled with Campbell and Gold discussing the game. The other two NHL teams that simulcast games take different approaches to intermissions. On the Buffalo Sabres broadcast, they take calls from listeners. The hosts conduct interviews during intermissions for Dallas Stars broadcasts. For home games during the week, Campbell goes from producing “Adam and Joe,” which on most game nights ends at 6:30, to hosting “Storm Watch.” After that, he hustles to the arena and gets there usually midway through the first period. Campbell said he’s been a hockey fan since he was a kid. If you still want to hear Kaiton, he does a video podcast called “Live Happy Show” with his friend PeteD’Arruda. On a recent episode, they interviewed former Canes star Erik Cole. The Athletic Carolina already had contributor Jodie Valade, a freelance writer, writing occasional stories about the Charlotte Hornets. But it hired Roderick Boone earlier this month as the full-time Hornets beat writer. While writing for Newsday, he covered the New York Jets from 2009–12 and the New Jersey Nets from more than three seasons until November 2015. He was a freelance writer, editor and proofreader before joining The Athletic Carolina. A native of Long Island, he is an Auburn University at Montgomery graduate. Ken Bradley, the managing editor of The Athletic Carolina, said via email that Boone would cover the Hornets on the road “when it makes sense,” and guessed that Boone would cover about half of the road games. Valade has more of a general-assignment role, and could write about various sports, including college basketball and the Carolina Panthers, Bradley said. 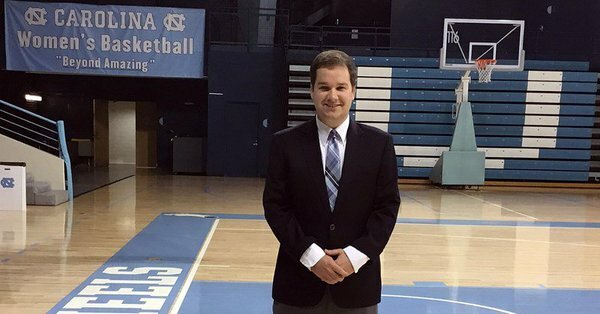 Matt Krause will take over radio play-by-play duties for North Carolina women’s basketball games this season. 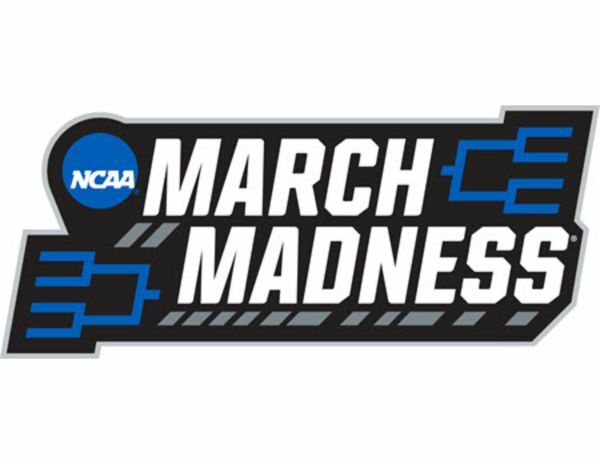 He replaces for Walter Storholt, a UNC grad, who will focus on his business career with Third Wheel Media, which he co-owns, after seven seasons calling the Tar Heels’ games. Krause, a 2015 Elon University graduate, has varied radio experience, including calling games for the Burlington Royals of the rookie Appalachian League for four seasons ending in 2017. He has filled in on Duke baseball games, worked select High Point University games and CAA championship events. He’s also worked ESPN3 broadcasts of UNCG and N.C. State games. He isn’t the first play-by-play voice of UNC women’s basketball who also called games for Burlington’s Appalachian League team. The late Stephen Gates, who died in an accident on I-85 in 2003, also called both teams. At the time, they were the Burlington Indians. Krause also will be the host for Coach Sylvia Hatchell’s radio show. Storholt also called numerous non-revenue sports on ACC Select, then ESPN and ESPN3 and broadcast UNC soccer games on WCHL for a few years. A quarterly publication, Triangle Sports magazine, has released its inaugural edition. 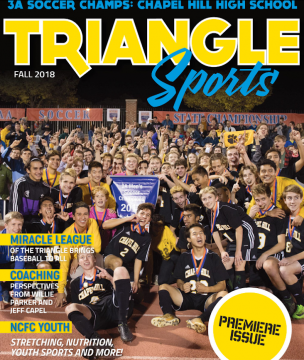 Mostly focused on community sports and high school sports, the main story in the debut issue, dated Fall 2018, was about Willie Parker being part of the Heritage High School football coaching staff, although Chapel Hill High School’s state champion boys soccer team graced the cover. The publisher is John Reister, who also owns retrofit magazine (which focuses on renovating buildings) and Roofing magazine. This is his first local publication. “I was thrilled to launch a local magazine featuring all of these great athletes, coaches, families, and teams in the Triangle,” Reister said via email. Reister plans for the magazine to be a platform to profile teams, athletes, coaches, medical professionals and families involved in sports and highlight the impact sports can have in the community beyond the playing field. 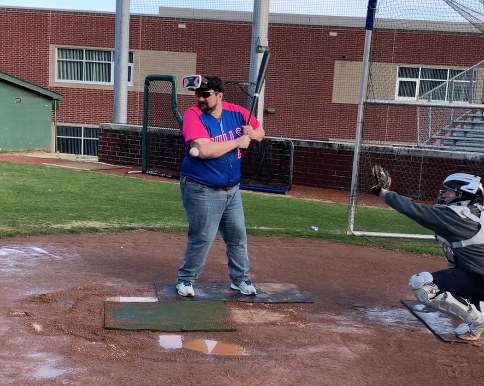 As Reister wrote in his debut column, his daughter played tennis at Athens Drive and his young son, who is autistic, plays baseball in the Miracle League of the Triangle. The next issue comes out in January. Copies are available by subscription or at Harris Teeter locations, medical offices and some retail outlets. In The N&O and Herald-Sun, Andrew Carter wrote about the difficult plight of the football players and coaches at Wallace-Rose Hill in the aftermath of Florence. In The Athletic, Nicole Auerbach wrote an interesting profile of Duke football coach David Cutcliffe, looking at how his upbringing, faith and work ethic have been the underpinnings that led him to Durham, where he’s done amazing things with the Blue Devils program. Scott Fowler of the Charlotte Observer produced a compelling seven-part podcast on the case of Rae Carruth, the former Carolina Panthers receiver who, in 2001, was convicted in the death of his girlfriend. “Carruth” is worth your time. On his blog, The Saunders Report, former N&O columnist Barry Saunders writes that he’s not buying into Carruth being the victim. In Charlotte Magazine, Valade talked about what Charlotte learned in the 20 years between seeing the city turn on two professional sports team owners 20 years after allegations surfaced about improper behavior around women. In The Athletic, C.L. Brown wrote about freshman UNC guard Coby White, who was once so unselfish as a kid that his coach threatened (and did) take him off the court if he didn’t shoot. He shot plenty during his high school career, but will now have to become a distributor as the Tar Heels’ point guard.